The hill reaches skyward in front of each contestant as they pull up alone to the orange spray paint line, the side of the hill loosened further by the previous rider. The crowd behind the big Klim gate waits eagerly, eyes and cameras ready for entertainment. Dan Dickie, co-founder of March Moto Madness, explains the course and prompts, “whenever you’re ready,” as the crowd prepares for another show. The options for performing on the hill climb are endless, from a controlled, clean run to the top, to a wheelie into the trees, to launching a heavy-handed roost of clay soil that may or may not get you to the top. Everyone is in it for a good time on the sunny Saturday afternoon to close out the last full day of riding in Tennessee. An hour south of Knoxville in the southern section of the Cherokee National Forest stretches a calm valley where the Conasauga Creek wanders its way past fields of patient livestock. The constantly growing number of adventure motorcycles that spend the weekend rumbling to and from the campground on Steer Creek Road have been a yearly experience for the valley since 2006. 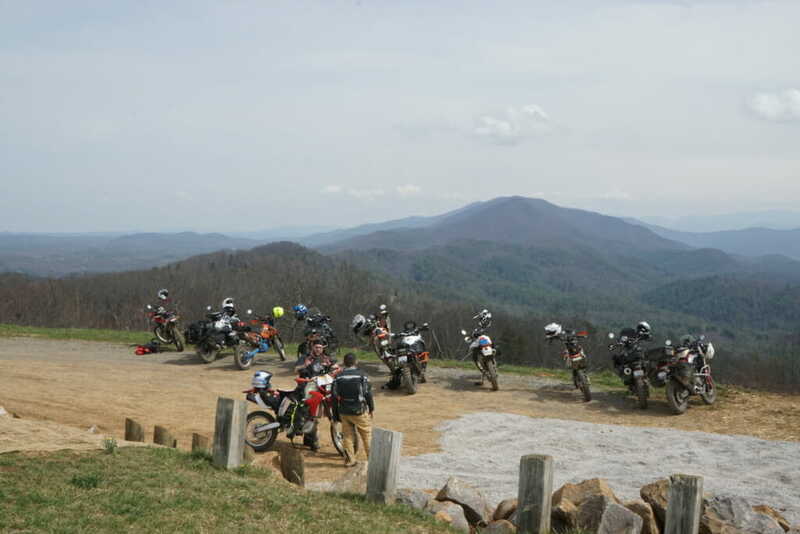 March Moto Madness is now a worldwide dual-sport and adventure motorcycle rally that has grown from humble beginnings in Tennessee, where the “Mother Rally” is held at the end of March. On clear days you can see for miles, but sometimes the fog rolls into the valleys and is equally beautiful. The second round of the medium-bike hill climb was made more challenging with an added cone weave to get to the top. All but two riders met their match! Immediately after signing in and choosing a camping area you can get right on the trails that snake their way out of camp or take to the pavement again in search of more singletrack, gravel forest roads, rocky powerline trails, river crossings and smooth mountain byways. The groomed gravel roads carve endless routes in and out of valleys and can bring you to some incredibly scenic overlooks. The powerline trails can be rocky or muddy, where you’ll have to be more diligent about choosing your line, but they’re wider than the singletrack. The popular singletrack options offer more technical riding, often on the very edge of a steep hillside, but skilled riders can generally get big bikes through. 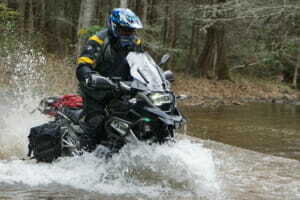 If the optional water crossing in camp isn’t enough to rinse off your bike, there is a nearby road with multiple water crossings of varying depth that offer a fun test of skills and good photo opportunities. 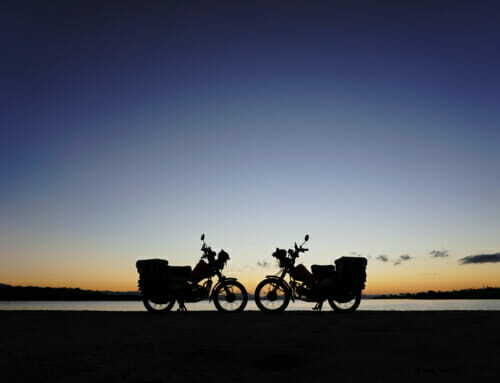 These riding conditions are a genuine playground for dual-sport and adventure motorcycles of all sizes, and the campground is nestled right in the heart of it all, so you rarely have to go far for any type of riding experience. And experiences are what you will get no matter where you ride. People drown their bikes in the water crossings, bikes get stuck on muddy hillsides, friends and strangers alike help each other out and share the fun. It’s a great time when strangers come together, one with a broken chain and bent parts, another with a tire lever to bend things back and another with the proper spare master link to get the bike moving again. 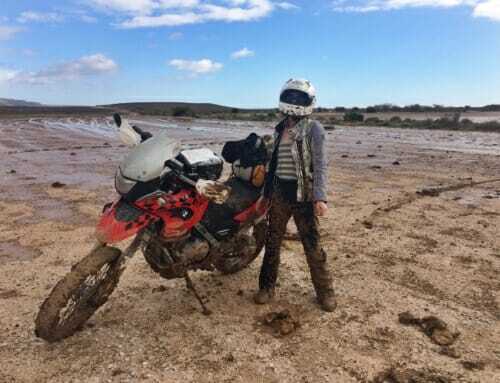 Jessica Washburn, who started riding dual-sport and adventure motorcycles roughly 20 years ago, broke her bike’s sidestand on the first day, but that didn’t hamper the riding much at all. 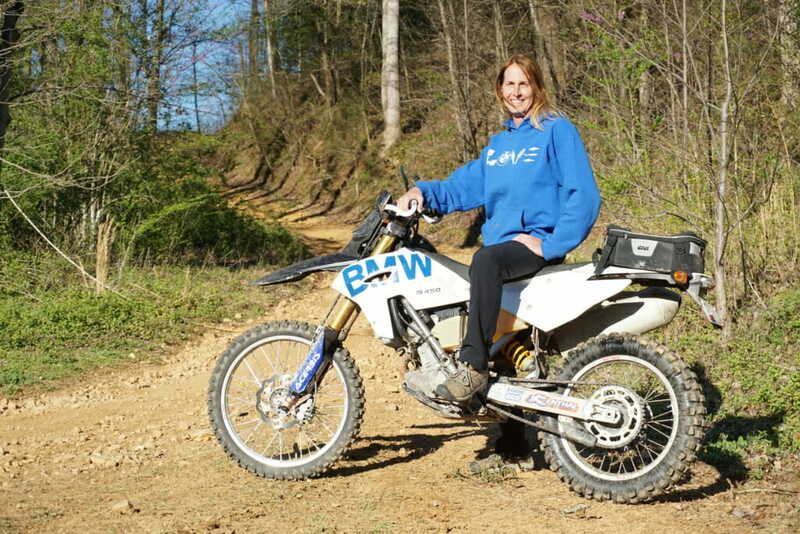 Jessica Washburn and her BMW G450X. Riders of all skill levels are encouraged to join, because maps and routes are available for self-paced exploration as are guided rides for all skill levels and bike sizes. 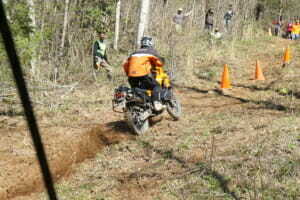 For large parts of the United States, this event is right near the start of the traditional riding season, so for those looking to expand their skillset with the guidance of experienced instructors, the Tom Asher Adventure Riding Academy (TAARA) and the Zacker Adventures riding academy offered courses throughout the weekend. Zacker Adventures held an all-women’s Ladies of Dirt 101 introductory course and TAARA offered intermediate and advanced courses. 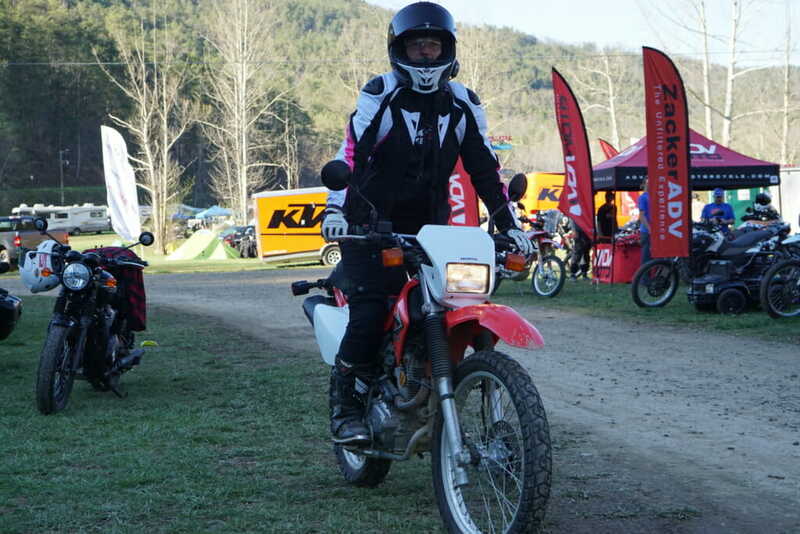 First-time March Moto Madness attendee Dianne Bannen who, after ten years of street riding, is getting more involved in off-road adventure riding and had an excellent time in the Zacker Adventures class. 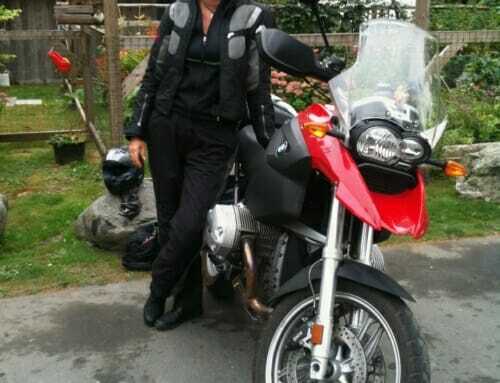 Dianne Bannen and her CRF230L rental. The event offers so much in addition to the riding, from the door prizes, raffle and meals included in the registration price, to the new, like-minded friends you can make over the course of the weekend. Bannen said she found two more women at the event to adventure ride with in the area. Adventure motorcycle rallies like this one are an excellent place to meet new people, even if you don’t know anyone well at first because you’ll make friends to see next year. We got lucky with just enough rain to make the water crossings interesting, but everyone in our group made it across without trouble. 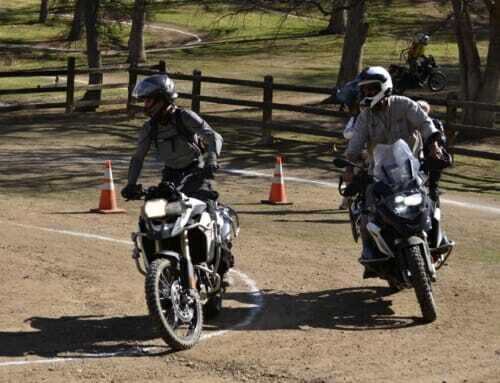 Fun and games – the Bike Games – held at camp include the Bike Limbo and the popular Friday Night Barrel Racing before Saturday afternoon when the big “Hill Klim” hill climb challenge and trials course are opened for competition. Big bikes displacing 1,000cc or more take one route, medium bikes sizes 500-999cc take a middle path and the small bikes under 500cc take the most technical route up to the top. 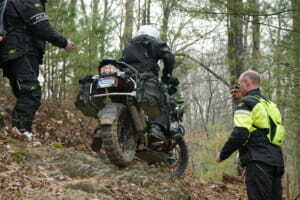 Wranglers help catch you and your bike if you don’t make it up while spectators and their cameras capture the glory. 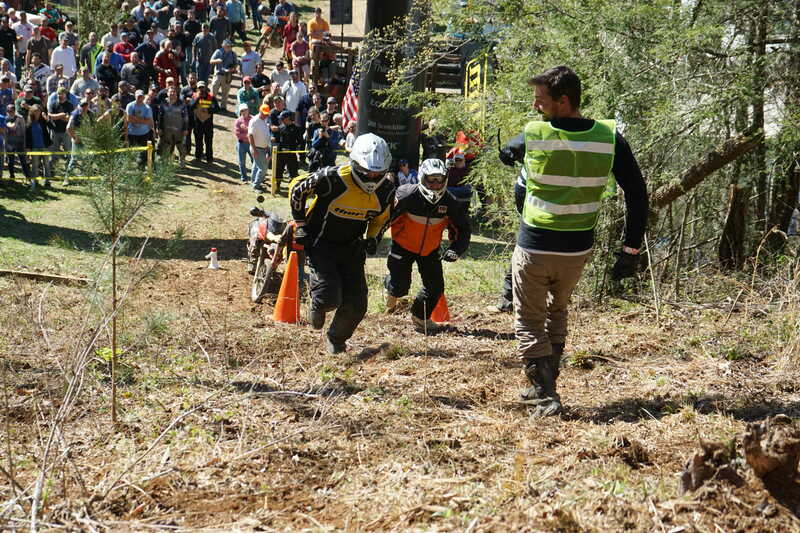 The trials competition puts low-speed skills to the test in a show of bikes and riders doing amazing things across logs, through deep mud pits and across all sorts of obstacles. Lukas Eddy is a junior at Michigan State University working towards a BA in Journalism with a concentration in visual communication. 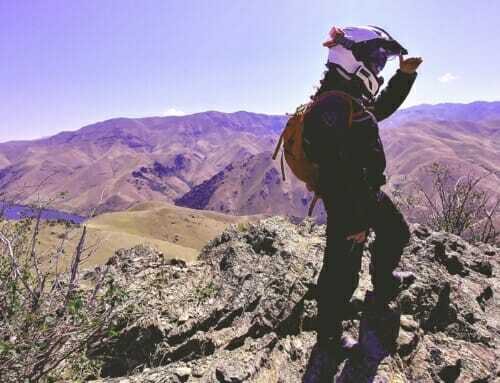 His life-long involvement in various outdoor activities meant that when he got his 1987 KLR 650, it only seemed reasonable to jump head first into adventure riding. 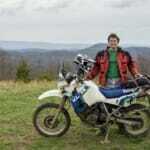 If he’s not working or maintaining the KLR, you can usually find Lukas riding somewhere around Michigan.